Flowerama delivers Get Well Flowers, Anniversary Roses, Just Because Planters, Cheryl's Cookies, and other fresh flower arrangements the same day to Pataskala. 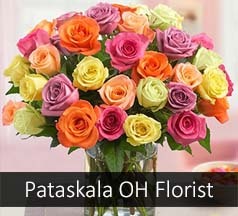 We named one of our arrangements after the city of Pataskala called "Picnic in Pataskala". If you want your delivery made by a certain time we offer cupids express delivery as well. We are a real local florist with real brick and mortar and have four locations near Pataskala. We are Pataskalas favorite florist and have won the Consumers Choice Award for six years running. So stop into one of our award winning retail flower shops, use our state of the art website, shop our mobile site or simple call us by phone at either (614) 256-6646 (BLOOMIN) or toll free at (888) 937-6355.